​where he compares Rapsodo with their Trackman unit. We used our Hack Attack Pitching Machine and HitTrax system to provide the input and comparison measurements for Rapsodo. HitTrax has 3 hi-speed cameras to track the flight of the baseball on the way in (pitch) and way out (hit) using the triangulation method to determine where the baseball is. 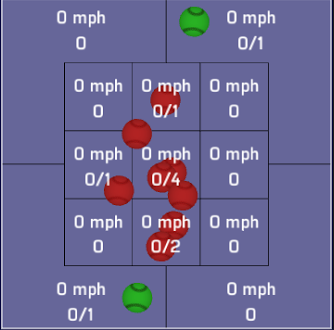 Hi-Speed Video analysis has proven HitTrax to be accurate in reporting the location of the pitch. We will use this knowledge in our testing here and not re-confirm with video. Ten 77mph fastballs from the Hack Attack pitching machine were thrown and measured by each system. We have measured several hundred pitches of various types and spot checked the location on many which indicated the unit was in the ballpark but the focus was on determining if the other aspects of the unit were viable (spin rate, spin axis, true spin and movement). This small sample was used to put concrete numbers on location accuracy. We have a couple of issues with the data that need to be discussed before looking at the results. First: the strike zone itself and dimensions/location. We have no way to align both systems to have the exact same center point location of the strike zone for vertical and horizontal directions or size of the zone. Therefore, pictorial representations may be off. Second: each system reports the location as above/below and left/right of a reference point. This reference point is not the same for each system. For HitTrax it’s from the middle/middle location of the strike zone. For Rapsodo, it’s the middle of the strike zone horizontally and appears to be from the bottom of the strike zone vertically (vertical reference point couldn’t be confirmed as of publication). To address these issues, we used the first pitch as our primary reference point and then measured how far away each pitch was from that reference point. By doing this we are measuring how much each pitch is different from the original pitch for location as measured by each system. We can then compare the two systems to each other as we are looking at the relative relationship of one pitch to the next. The first 4 columns of data show the difference in location from the first pitch for both systems in the vertical and horizontal directions. The Rapsodo differed from HitTrax on average 1.3” horizontally and 1.8” vertically. The diameter of a baseball is just under 3” so the difference in location is roughly half of a baseball. However, a couple of the pitches differed by more than a baseball vertically. ​than we expected. Having the catcher’s view with the camera certainly proves to be helpful in this regard. Here are a couple of pictures from the two systems showing the location of the ten pitches. As you can see, visually they are very similar. The differences of exact location with respect to the strike zone can be attributed to calibration (user dependent) and the actual dimensions of the different strike zones. The HitTrax strike zone dimensions in this case are 18” wide by 16.4” tall (varies by hitter). I don’t have the Rapsodo dimensions as of this posting. Is half a baseball close enough? Well, that’s really up to you. An error of 1.5" in this environment is reasonable in both a training or game situation; most umpires are not this good. I would just like to reiterate some of the statements that Kyle made in his post. Rapsodo has been extremely responsive during all of our testing and very appreciative of the feedback. They are a pleasure to work with are very much interested in providing a product that is accurate and reliable. It’s not without it’s issues but I’m confident that not only will they be resolved but new enhancements and features will be added. to aid in their development. Disclosure: we were provided a unit free of charge in exchange for beta testing and providing feedback to help them bring their product to market. On August 29th, 2015 Liam Norris, an assuming 6’1”, 175 pound 14 year old, walked into the K-Zone Academy for an evaluation in order to begin our remote training program. His father, James Norris, had driven him in from Virginia some 3.5 hours away. We ran him through a battery of tests and showed him several drills and exercises he would be doing remotely. Liam is a good size (6’1”, 175lb) for his age and is a lefty thrower, lefty hitter to boot. Below are his baseline numbers and hitting charts from his first couple of visits with us. (HitTrax system) Key statistics are highlighted. ​All in all, not bad performance for someone entering the 8th grade. Liam’s goals at the time were to be like Clayton Kershaw (what lefty doesn’t), throw 84-85mph of the bump, hit the ball 90mph/350ft, be more aggressive at the plate and improve his command. Those are some goals. So, we put together a plan and got to work. Liam did most of the work at home with the help of his Dad. He trained 5-6 days a week and visited once a month sometimes more. It was challenging for Liam to stick to the training schedule and keep up on his school work, etc. ​The visits to the K-Zone energized him each time. Competing against the high school and college athletes here drove him to improve and he developed some strong friendships in the process. After 5 months of hard work Liam had reached some of his hitting goals. 91.5mph exit speed and 364ft. He was definitely more aggressive and was striking out far less. If you look closely at his early spray chart above, you will notice that he was hitting a lot of baseballs to the opposite field but there was nothing behind them. James liked to refer to his hitting style/profile as “Jeter” in reference to Derek Jeter’s inside/out approach to take the ball the other way. But at this time Liam was pulling the ball with authority. He was making significant progress on the throwing side too; increasing his pull-down to 89.7mph and feeling much stronger/healthier to boot. By the time Liam’s season was ready to begin in the spring, he was ready to show off his newly developed skills. Unfortunately, his at bats were limited and pitched only 4 innings the entire season. Needless to say he was frustrated. Being Liam, this fueled him to return to his training with a vengeance. Liam and his family moved to the Raleigh area at the end of the school year and began to train full-time at the K-Zone. HE THRIVED! 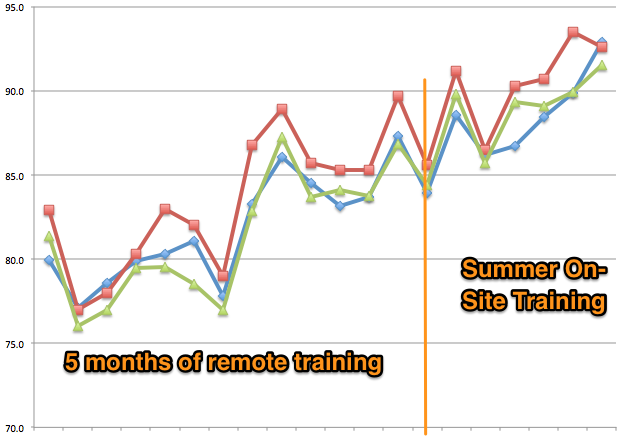 Liam stopped doing specific velocity training in season (orange line) but continued to train in season. As a result, when he joined us in June he broke the 90mph barrier for the first time! His current record is 93.5mph; a 10+mph gain in a year. 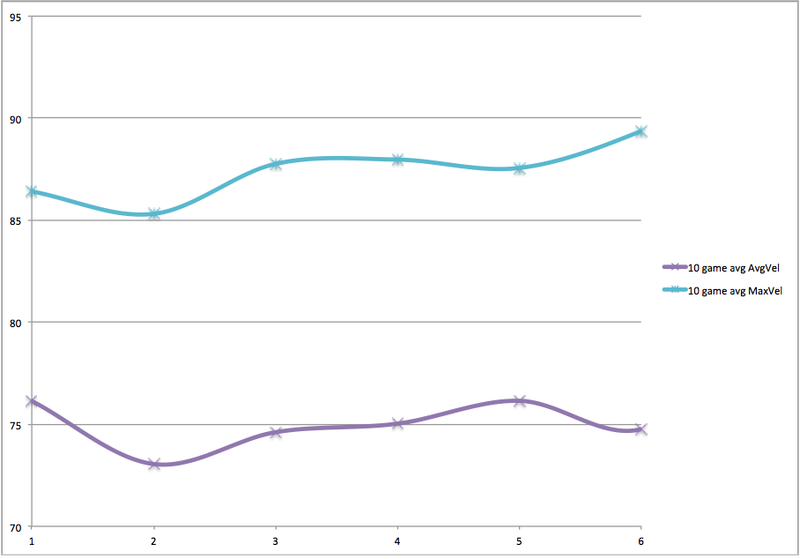 ​Below is his velocity development to date from the beginning of his training. 0% Strikeouts. He’s improved immensely in every measurable way. This fall, Liam took his new skill set to the field entering a PG Showcase event and his life hasn’t been the same since. He did so well at that event, he was invited to participate in a game with the top Forty 14 year olds in the country. His fastball now tops out at 87mph. He is ranked #5 in the country for the 2020 graduating class. The top collegiate programs are recruiting him aggressively. All this despite not being “good enough” to garner more than 4 innings of work for his HS JV team. Liam is a great example of how important developing your skills and abilities through training is. He didn’t play a bunch of games this year or attend several showcase tournaments or take weekly one on one lessons. He trained hard nearly every day for over a year and has turned himself into a top notch ball player. So, when you see Liam out on the baseball diamond know that you are looking at someone who has worked very hard to be this good; he didn’t just wake up great. It is commonly accepted that the faster the pitch the harder the hit; the pitcher supplies the power. On the surface this makes sense. If this is indeed true, one would argue that you can hit a fastball further than a curveball since a fastball is coming in with more velocity. However, there are other factors to consider. Many coaches tell there players to hit the ball with back spin because that will carry the ball further. This is indeed true that backspin creates lift or carry. A curveball has topspin (it’s already spinning in the direction of backspin) and the fastball has backspin (its spin needs to be turned around to create back spin). Because of this curveballs are hit with more backspin than fastballs. So, which one is more important; backspin or velocity? We decided to conduct a little study using our HitTrax simulator which gives us all the data we need to answer this question. The question of which pitch can be hit further has already been addressed by some of the brightest minds in the field of physics (See this article by Alan Nathan). What we are going to try to answer is “Which pitch is more likely to be hit for a home run?”. 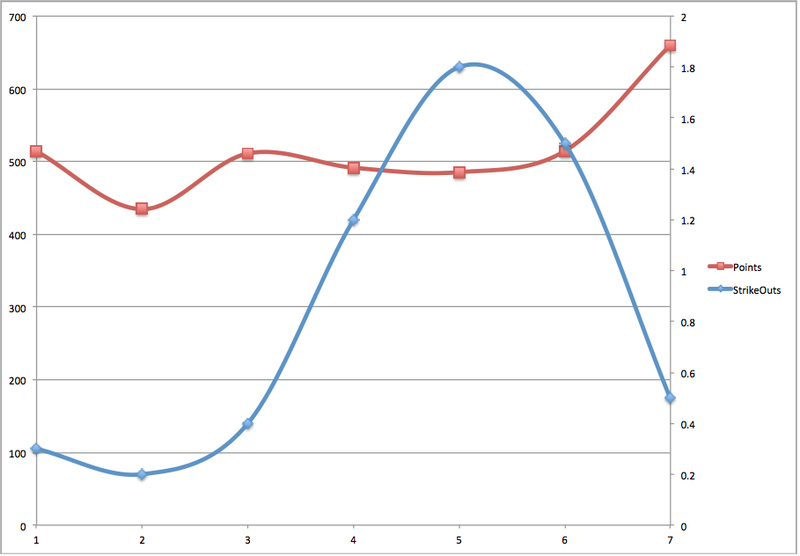 After all, it doesn’t really matter which one can be hit further unless it’s by a large margin (it isn’t). One of the most important factors in hitting a home run that is rarely, if ever, discussed is the launch angle; the angle the ball leaves the bat. I imagine the reason for this is that it’s fairly obvious that you need to hit the ball with a positive launch angle to hit a home run. So, the question that I think we need to answer first is which pitch are hitters more likely to hit with a launch angle that could produce a home run? We looked at 3 hitters in this study, all are different types of hitters. In other words, their typical exit velocities and launch angles are not the same. Although capable of hitting home runs, none of them would be classified and long ball hitters. We measured their performance in a game environment, so their goal was simply to score more runs than the other team and win the game. Each player was the sole representative of his team, so he took all of the at bats in a 9 inning game (between 34-49 at bats per game). 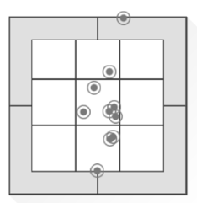 The pitch did not vary during the game; one game was fastball and the other game was curveball. One of the most interesting findings is that the exit speed of the batted ball is not significantly different between the pitches; must less than you might have expected. You can read more about why that is in Dr. Alan Nathan’s article referenced above (hint: it’s the coefficient of restitution; COR). The data clearly shows that the average LA for the curveball is significantly higher than that of the fastball for all hitters. Consequently, curveballs are more likely to be hit for home runs than fastballs. The fastballs, on average, aren’t even hit at a launch angle that would produce a home run (based on the average distance, they aren’t even leaving the infield in the air). If you can hit either pitch with the same velocity then the one with the better matched launch angle is the winner: curveball. Next time you are wanting to take one deep, look for the curveball. 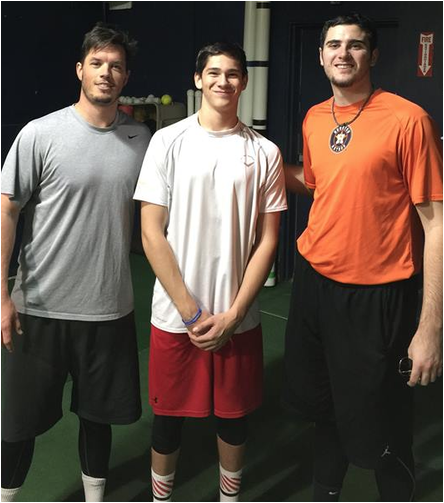 Cam Lengyel has been coming to the K-Zone Academy for his training for a long time. He was around last summer when we were developing the concept of the Quality Hit Game. He’s played it many times. We are going to look at his data for the 70 games we have in the database for him dating back to October 2014. In Cam’s first recorded game, he scored 280 points, 71 points on his best hit, maximum exit velocity (MEV) of 86.3mph, average exit velocity (AEV) of 70.6mph, maximum distance of 295 feet. His last game in the data set he numbers were 723 points, 114 points on best hit, MEV of 93.0mph, AEV of 80.4mph, maximum distance of 349.4 feet. This is quite an improvement. However, single game scores can often be misleading so we are going to look at Cam’s progression in 10 game sets; first 10 games, second 10 games, etc. Doing this we will highlight a few of the key points in Cam’s development. 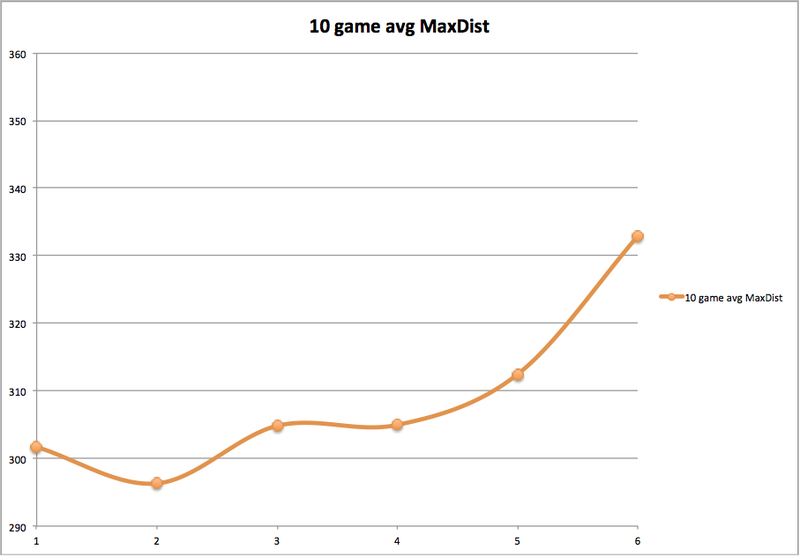 The chart below shows the average of each 10 game set of Quality Hit Games played. Cam started out with an average of 514 in his first 10 games and increased that to an average of 659 in his last 10 games. Through his first 60 games, Cam shows little to no improvement with his 6th set of ten games yielding a very similar 514 average to his first set of 10 games. At first glance, it doesn’t look like Cam improved at all during that long stretch. Certainly, by this measure that would not be incorrect. However, there are other numbers we can look at to help “predict” the big jump that Cam has seen in his performance in the last 10 games. 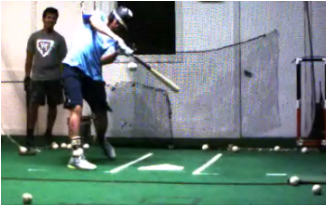 Quality Hit Game are to hit the ball harder and farther without straying too far away from a line drive trajectory. Hard line drives that carry further score the best. Let’s take a look at Cam’s best hits over his first 60 games. As we can see, Cam’s best hit in each set as well as the average of his best hit for the 10 games increased throughout the 6 weeks. This means that Cam’s capability is increasing even though he hasn’t increased his average game score. Let’s look at his MEV, AEV and Maximum Distance results. These factors have all improved as well which fits with the improvement in his best hit measurements except for the AEV. These numbers are all visible to Cam during his training, so even though he isn’t making noticeable improvements in his best overall game average, he is improving his exit velocities, distances and hit quality. It keeps him motivated to keep putting in the hard work it takes to get to the next level. It’s a matter of time before he puts it all together. That time has come in Cam’s last 10 games. 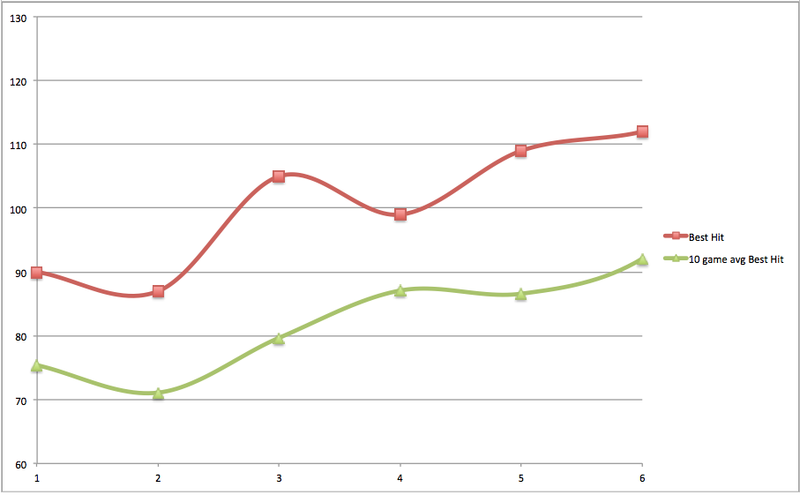 One of the numbers that we haven’t shown yet that has contributed to Cam’s improvement is his reduction in strikeouts. During his plateau he increased his strikeouts by over one. This means that he’s taking a zero for that at bat. Makes it difficult to increase total game scores when you are adding in zeros. Notice the reduction in strikeouts in the last 10 games. Couple this with the increase in exit speed and distance and you have a recipe for success. Sometimes you have to give something up to gain something. In this case, Cam had to be willing to strikeout more in order to increase his exit velocities and distances. Once he did this, he was able to bring his strikeouts down near previous levels while maintaining a higher level of output from his swing. Another factor that was addressed with Cam, but not covered in this analysis is where he hit the ball. Some of his best hits used to be foul; this is no longer the case. Using K-Zone Academy proprietary training exercises, Cam has been able to redirect his power into the field of play. It’s not just a phenomenon for the cage as Cam lead his team to a state title this past weekend driving a baseball just left of center that carried the center fielder for a go-ahead RBI double in extra innings. The plateau that Cam experienced lasted almost 5 months. This is where the real work is done. It’s also where most players give up. If you are dedicated and willing to put in the hard work, you too can have success like Cam! As a matter of routine at the K-Zone Academy, we measure the performance of our players. At all times the players know where they stand. They are acutely aware of their current performance. One of the ways we do this is with our HitTrax simulation system. The HitTrax is a system developed by InMotion Systems to track the speed and direction of the baseball, both from the pitcher and once it’s hit by the batter. It uses high speed cameras to triangulate the location of the baseball and accurately determine the speed and direction it’s moving. We have used this system for 2 years now, collecting data, tracking players performance, validating training methods, etc. We are continually learning how to better measure, teach and instruct our players. Here is a recent case study. Andrew didn’t make his high school team this spring. As you will see from the initial measurements we took, it’s clear why. Here is a review of Andrew’s current session. In 15 at bats, 100% of his hits were ground balls. His peak batted ball speed was 77mph with an average of 63.5mph. 77mph is not bad for a high school freshman, but the average of 63.5mph is below average. The fact that Andrew hit everything into the ground is an obvious concern and an area that required immediate attention. What is less obvious in the charts below is that Andrew swung at 4 of the 9 balls he saw; that’s a chase percentage of 44.4%. Another area we want to address now. Armed with this information, we put together a plan for Andrew and he got to work. In less than one month, here are Andrew’s improvements. His maximum batted ball speed ticked up to 78.2mph in this session (his new peak is 82.5mph) but his average jumped to 73.4mph, a 10mph improvement! 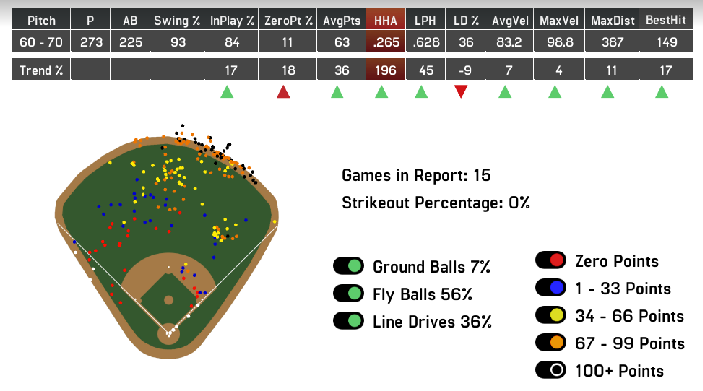 You can also see a very different distribution of his hits on the spray chart. Almost everything he hit is in the outfield and his line drive percentage is 55% up from ZERO! 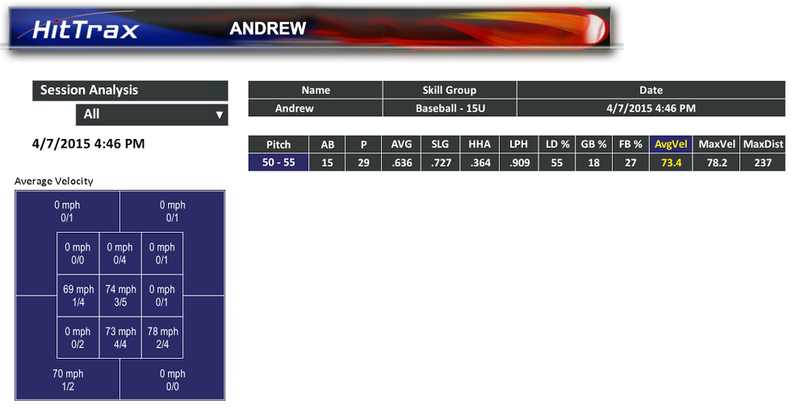 Andrew is hitting the ball harder, more consistently and with a better launch angle (meaning more line drives). Andrew only swung at one ball out of the strike zone and he even hit that ball well. He also hit his first double. How did Andrew make such a significant improvement in less than one month? It was through a combination of exercises and training specifically designed to address his issues. For his early pitch recognition issues, we use a method utilizing a device known as the V-Flex. With the V-Flex, we are training the hitter’s brain to identify and swing at strikes and identify and not swing at balls. We’ve been using this for almost 3 years now with tremendous success in helping our hitters become more disciplined at the plate and smash balls in the strike zone. This was/is part of Andrew’s regular hitting training routine. 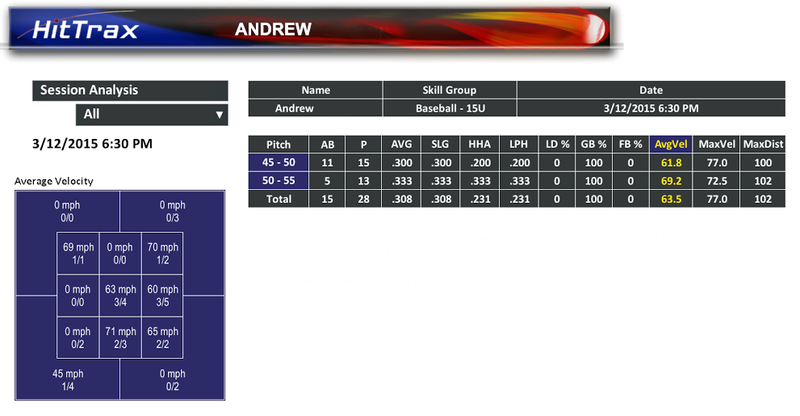 Another major contributor to Andrew’s improvements is the HitTrax system and how we use it in our training. We have developed a proprietary method for measuring the quality of every hit. With this measurement, we can better direct the players training and the adjustments he needs to make. Better, more objective, immediate, appropriate feedback equals better results. That’s what our Quality Hit training mode does. 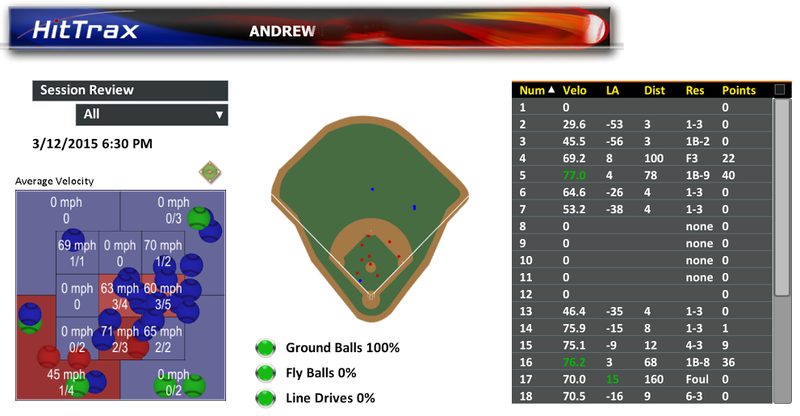 For example, Andrew’s first session, where he hit all ground balls, his score was 142 points with his best hit yielding 40 points. In his latest session, he scored 455 points with 6 hits scoring 43 points or more. In that session, Andrew set 3 personal records: most quality hit points for a hit of 67 points, most total quality hit points for a session of 455 and most line drives in a session with 6. This type of improvement is not unusual for us to see. Players like Andrew train in an environment that provides them immediate, objective, constructive feedback. Their key performance characteristics are tracked so that they know the very moment they set a record and can celebrate it immediately. This is a self-motivating and fun. Two key ingredients to long term success. Another thought or question arises from Andrew’s past month of work. If he had done this the month before the tryouts, would he have made the team? There is no way of knowing, but his chances would have been dramatically improved. However, Andrew is learning the lessons of hard work, deliberate practice and what it takes to improve your baseball skills. He’s also taking comfort confidently knowing that nobody that made the team has made the amount of progress that he has made in the last month. Do you have what it takes to be great? Before you answer, let me tell you a story. This story begins about 3 years ago when I started a high school tournament team with players that trained at the K-Zone that summer. There was a player on that team that had some raw ability but very little talent. He could throw the ball 74-75mph but had no idea where it would go. He could hit it 72mph or so, but didn’t connect very often and rarely hit it that hard when he did. That player was Damian Henderson. He was just coming back into the game after stepping away from it at a young age due to a bad experience he had. He was ready to give it another go. We had 14 players on the team that year and this player was one of the youngest and was clearly the worst of the bunch. This fact never phased him. He always brought a lot of energy to his training, practices and games. He didn’t play much that season and when he did it wasn’t pretty. It was difficult for his parents to watch him struggle. However, he and they were in it for the long haul. Damian was determined to be great and his parents were ready to support him in that pursuit. If you saw him play today, you might say something like, “that kid’s a natural”, or “he’s gifted”. He looks nothing like the player he was 3 years ago except for the infectious smile. He now hurls the baseball 96mph (91mph off the bump) and slugs it over 97mph. He outperforms each and every player he played with on that team from 3 years ago and some of them are playing college baseball. Greatness, you see, is not bestowed upon the lucky few, it is not something you are born with...it is earned.